Why is Slack Called Slack? The inspiration behind Instagram was not beautiful images and filters, the inspiration behind Twitter was not hashtags (#) and 140 character updates and the inspiration behind Flickr was not hosting and photo-sharing. Like these powerhouse brands that evolved over the years, Slack was no different. Believe it or not, the idea behind Slack was derived from the struggle of team communication when developing a gaming company called Glitch. Slack is a slick piece of inter-office software that allows teams to communicate more effectively. Down to its very core, the product aims to better organize and structure conversations among internal teams. And at the moment, it’s less about replacing email and more about complimenting it. Within the tool, you could create a team titled “Marketing” and get more granular by creating channels titled: Social Media, Events, Email Marketing, SEM, SEO, etc. Certain team members can be a given access to different teams and channels. While collaborating in the tool, users can use hashtags (#), mentions (@), search for past topics, send private messages and more recently, use emojis. The product is truly a mix of email, Twitter and Facebook Messenger. Why is it called Slack? In project management, you’ll hear a lot of different terms get tossed around. If you’re in the field, you’re already aware of milestone, scope, sprint and many others. Chances are you’ve also heard float, too, or as it’s sometimes called, slack. This is where we originally thought the name was derived from, but today (9/27/2016) Founder, Stewart Butterfield published the tweet below. At the moment its unclear if Slack is an acronym or a backronym – an acronym deliberately created to suit a particular word or words. I’ve tweeted Butterfield for clarification and will update the article when I hear back from him. Slack, in project management, refers to the amount of time a delay could take from a task without causing subsequent problems. So if your current assignment is held up because you’re waiting on someone to get back to you, but you have a month to finish, you could say, “I have at least a few weeks of slack, so waiting another day won’t be a major problem.” It implies flexibility in the project schedule, a positive. Our name may seem funny, but think on this: without slack, there is no reach, no play, no flexibility, no learning, no evolution, no growth. The company was founded in August 2013 (became publically available in February 2014) by Stewart Butterield (former co founder of Flickr), Cal Henderson, Eric Costello and Serguei Mourachove and is headquartered in San Francisco, California. To date, the company has over 2 million daily active users (DAUs), has raised over $330 million in funding and is valued at more than $2.8 billion dollars. Lastly, Slack integrates with a large number of third-party services to keep the conversation in one place. Integrations include, but are not limited to: Twitter, Google Hangouts, Asana, Grove, Google Drive, Trello, Dropbox, GitHub and one of my favorite services, Zendesk. 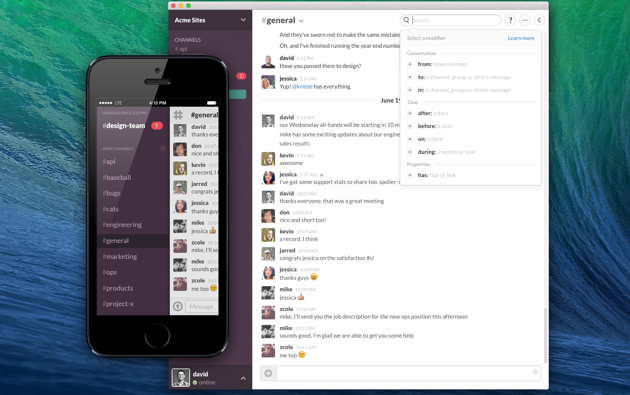 Post Updates: Slack adds free conference calling.